I remember a lot of what Grandmother taught me, but not much of what she said. Probably because she said very little. Grandmother showed me wood fences and stone walls were for climbing over, not for stopping at or complaining about at all. The best berries and sweetest flowers might be along the trail the fence-builder had not noticed or thought about when building. She never built a wall, not that I remember. We walked over plenty of them together in the hills in the Catskills when I was young, and in the hot flat land of Florida later when she moved down south. Grandmother showed me the land was to be enjoyed and explored quietly, not owned or fought over. No one owned land Grandmother walked over, and if they thought they did, then I heard her set them straight pretty quickly with no fuss at all. She would name plants at their feet, ask about their crops and gardens, things like that, all friendly-like. You could not dislike her, I think, even for a moment. Trespassing signs were not something she ever even looked at, when I followed her walking along soft paths animals may have made before her. Grandmother sometimes picked up decorative flowers on our walks, but if they weren’t to be immediately eaten, she picked them up from the base, soil and all. She collected a wild columbine in the forest by the house complete with its roots, and brought it back for one of Mother’s shade gardens. Columbine is a delicate and beautiful red flower that seems to nod, suspended on a long stem. It looked magical to me as a child. Grandmother picked honeysuckle blossoms, whether wild or cultivated by someone’s house. I watched her make iced tea from the flowers. She plucked clover blossoms in front yards, and taught me to sip the base of each floret pressed between my teeth. A faintly sweet treat found everywhere wild things grow in New York. She collected chamomile flowers by roadsides, they grow all over in NY, unnoticed for the most part, but are a wonderful sedative in tea, and “legal”. When my own daughters were young, they watched me do the same. Grandmother picked the shimmering blue green leaves of lambs quarters, a delicious wild green, which many name “weed”. 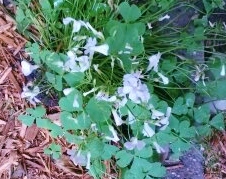 That is how I knew this was the mystery plant in my friend’s garden that we were talking about at work. When I was young, Mother pulled these out and discarded them as weeds. The idea that some of these wild things might have been sprayed with pesticides nearly drove Mother mad, but Grandmother could not be dissuaded from her habits, and I couldn’t help but follow here around tasting everything she found with her. Grandmother really never listened to anyone about anything like that as far as I remembered, but she was older when I knew her so that was fine with me. I ate some poisonous things now and again accidently, by myself, but not when I was with her. Much later I came upon records implying Grandmother’s family roots were aboriginal, and I don’t know why it never occurred to me in my youth. Like the quiet and magical forest, this is a mystery that stays hidden and treasured in my heart and makes a quiet, persistent path through some of my fiction writing. Jennifer, this is a beautiful essay about your mother and grandmother and plants – beautiful photos, too, Enjoy the rest of your Independence Day. Thanks Barbara, I remember the family especially when gardening in that quite time. Have a wonderful Independence Day. Thanks for the visit Deborah, sharing your comments here, and your encouragement about writing. I hope you have a great holiday today. Hi Rich, thanks for the visit and I’m happy that you liked the story. It’s funny how many people shy away from using native plants, but I’ve always enjoyed it myself. My paternal grandfather had a gift for using native plants. He grew up very close to the land, helped us on our farm. Our orchards were interspersed with cross timbers of oaks and other hardwoods.